Calgary taxpayers last year paid $133 for Mayor Dave Bronconnier to ride in a limousine in Alberta’s capital , $1,195 to regularly clean his luxury SUV , $5,509 for the civic politician’s Christmas cards and $30,151 for him and five staff to park at City Hall. 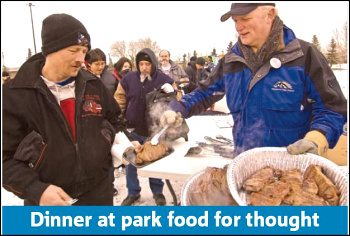 CALGARY – Calgary taxpayers last year paid $133 for Mayor Dave Bronconnier to ride in a limousine in Alberta’s capital, $1,195 to regularly clean his luxury SUV, $5,509 for the civic politician’s Christmas cards and $30,151 for him and five staff to park at City Hall. According to detailed expense records obtained by the Herald, these items show how Bronconnier and his staff spent some of their approximately$ 1.5-million budget last year–expenses that also included more than $12,000 on photography and videography, and nearly $25,000 on the mayor’s website. The revelations come one day after financial records showed Calgary aldermen billed thousands of dollars last year for dry cleaning, personal websites, home security systems and golf. The mayor’s documents, obtained through freedom of information requests, shed light for the first time on what critics say are some needless expenses, but costs that Bronconnier defends as justified. All the expenditures, from photography to flowers for public events, are part of the job, Bronconnier said. "You have to look at it and say, ‘What is the role of the mayor?’ " he said in an interview. "That is part of the protocol function of the mayor’s office. All of those come with a cost." One of the most notable expenses by the mayor related directly to his vehicle. Last year, Bronconnier charged $1,195 to get his white SUV picked up, cleaned by Tlc Auto Detail and dropped off nearly every week he was on city business. The cleaning tab was just one part of the $18,775 used to cover costs connected with Bronconnier’s vehicle, according to the records. Instead of having a driver as past mayors have done, Bronconnier received a monthly $1,316 car allowance last year, billed his gas to the city and charged another $9 in maintenance. He defended the cleaning tab, saying his car needs to be ready to shuttle officials, politicians and community representatives around–and it has to look right. "It’s a city car, it’s a city parking spot, and the car needs to be cleaned," he said, noting he has to pay personal taxes on the car benefits. "It’s a lot cheaper for the taxpayers to have the mayor driving his own car than to have a police officer driving (the mayor) around in a city car." But Scott Hennig, Alberta director of the Canadian Taxpayers Federation, said having separate cleaning and gas tabs on top of the car allowance is "a stretch." "That should all be coming out of his car allowance," said the spending watchdog. "Thirteen-hundred dollars a month will still cover a lease on a very nice vehicle." Hennig said Bronconnier’s salary, which was$172,462 last year and rose to $181,947.26 this year, should also be enough to pay for some of his expenses. Transportation figured prominently into what the mayor’s budget spent on personal expenses, salaries and office purchases. Bronconnier’s office billed for two charter flights for a return trip to Edmonton last year at a cost of $3,994, and also charged $133 for a limousine service in the Alberta capital. The flights, billed for meetings with Transportation Minister Luke Ouellette and Edmonton Mayor Stephen Mandel, were well worth it, Bronconnier maintained. Driving to Edmonton with staff from his office would eat up at least a day of work and potentially more for several people, he said. Taking the charter flights, and hiring a limo so they didn’t have to wait for a cab at all their destinations, meant they could get more work done and be more efficient, Bronconnier said. "It’s called time. It’s that simple," he said, defending the flights. "If it wasn’t worthwhile, I wouldn’t be doing it." David Taras, a political analyst at the University of Calgary, said the flight costs are hard to justify. "Two-thousand dollars is enormous for going to Edmonton (one way). That’s a lot of money. It could take you to London and back," he said. Taras said the line between what is and isn’t appropriate needs to be more clearly drawn and made more public. Bronconnier’s role is symbolic and ceremonial, he said, and there’s good reason for much of the spending the mayor and his staff rack up each year. But with that spending comes the obligation to answer for every penny, and when it comes to Bronconnier’s explanation for the flights, that response is insufficient, Taras said. Overall, the mayor’s office spent $28,288 on travel last year, according to the records, which included trips to Dubai, Washington, D. C., Victoria and Ottawa. But the mayor’s office spent even more on parking for six staff: $30,151 in total. Bronconnier said getting free parking downtown, an area with notoriously high parking rates, is a perk that’s used to entice people to work in his office. "It’s part of the total compensation package," he said. The mayor’s website, a city-owned address launched under Bronconnier’s watch, was also the focus of tens of thousands of dollars in spending. It cost $24,200 last year to develop and update it, according to the records. That followed a separate $25,000 update in December 2007. And it cost at least $12,394 for photography and videography at various news conferences and public events. Much of that material was then posted on his website. That material included $1,687 for an online annual report as well as another $2,177 for the mayor’s 2008 report to the community. The latter also cost the city around $26,000 to produce in collaboration with Shaw, Bronconnier said. Every dollar was aimed at getting more information to Calgarians, he argued. "Too often people criticize us if you don’t communicate," he said. "Citizens have the right to know, and government has a duty to inform citizens. In order to inform, it costs money. It’s not free." The report to the community was a major cost savings compared to the approximately $100,000 it used to take to mail the same information to people’s homes, Bronconnier said. The mayor’s office expenses also detailed other cash spent to get his message out. A news conference in connection with the Municipal Sustainability Initiative, the provincial fund that delivered $3.3 billion to Calgary, cost taxpayers $1,763 to put on. "We spent $1,763 on a press conference that yielded $3.3 billion for the city after a four-year battle with the province. I think that’s damn good value," Bronconnier added. Last year’s Juno Awards also saw money spent on promotions, with $6,229 being doled out for signage, audio-visual equipment and photography at a Juno announcement. And the mayor’s annual Christmas cards cost taxpayers $5,509 last year, while a ceremonial cheque for the Trico Centre rang up a $317 bill. One thing Bronconnier didn’t spend money on was dry cleaning, separating himself from 11 of his council colleagues who did. Dry cleaning is a personal expense, he said, and shouldn’t be covered with public dollars.